Vol. 6, No 2, SORAT Praweenwongwuthi et al. This paper describes changes in the pattern of land use in two riverine districts of Nakhon Phanom Province between 2006 and 2010. A great deal of land use change occurred in these five years. In Mueang District, about 12.1% of the area (9,477 ha) had a different use in 2010 from that in 2006. In That Phanom District the magnitude of change was even greater, with about 27.3% of the area (9,326 ha) changing use between 2006 and 2010. Much of the land use change in both districts resulted from the conversion of natural forests, orchards, and rice paddies into rubber plantations. At the same time, rapid urbanization led to the conversion of large areas of farmland into housing estates in the peri-urban zone around Nakhon Phanom City and, to a lesser extent, around That Phanom district town. Most of these land use changes are reducing overall agroecological diversity. Several factors have influenced these land use changes, including lack of secure land titles, urban growth, and changes in the costs and benefits of growing different crops. Although it is known that the agrarian transformation in Northeast Thailand has resulted in major changes in land use in the region, including a decline in the area of natural forest due to the expansion of cash crops and the conversion of agricultural land into the new housing estates that surround the region’s rapidly expanding urban centers, detailed empirical studies on the nature and causes of land use changes in specific areas are lacking. Therefore, the present study was carried out in order to describe recent changes in agricultural land use and identify the factors influencing these changes in two districts along the bank of the Mekong River in Nakhon Phanom Province. This area is of particular interest because it is characterized by more fertile soil and a higher amount of rainfall than is typical in Northeast Thailand. It also borders the Lao People’s Democratic Republic, to which it has been linked by the Third Friendship Bridge between Nakhon Phanom and Khammouane Provinces, which was officially opened on November 11, 2011. This and other transportation links, which are being built in the context of the Greater Mekong Subregion Economic Corridor and ASEAN Economic Community, may be influencing changes in land use in the area. This study was conducted in Mueang and That Phanom Districts in Nakhon Phanom Province (coordinates: Upper left 17.99N, 103.96E, Upper right 17.99N, 104.86E, Lower left 16.70N, 103.96E, and Lower right 16.70N, 104.86E) in the valley of the Mekong River (Fig. 1). Neighboring provinces (clockwise from the south) are Mukdahan, Sakon Nakhon, and Bueng Kan. In the northeast, the province borders Khammouane of Laos. The northern part of the province has both uplands and forest-covered plains and is drained by the Song Kram and the smaller Oun Rivers. The southern part is mostly flatland, with the Kum the only notable river. The provincial capital, the city of Nakhon Phanom, is located directly on the bank of the Mekong. Mueang Nakhon Phanom is the capital district of Nakhon Phanom Province. Mueang District is subdivided into 15 subdistricts (tambol), which are further subdivided into 169 villages (muban). The city of Nakhon Phanom (thesaban mueang) covers all of Nai Mueang and Nong Saeng Subdistricts as well as parts of At Samat and Nong Yat Subdistricts. That Phanom District is in the southern part of Nakhon Phanom Province. The district is named after Wat Phra That Phanom, the most important Buddhist temple in the region. The district is divided into 12 subdistricts, which are further subdivided into 142 villages. 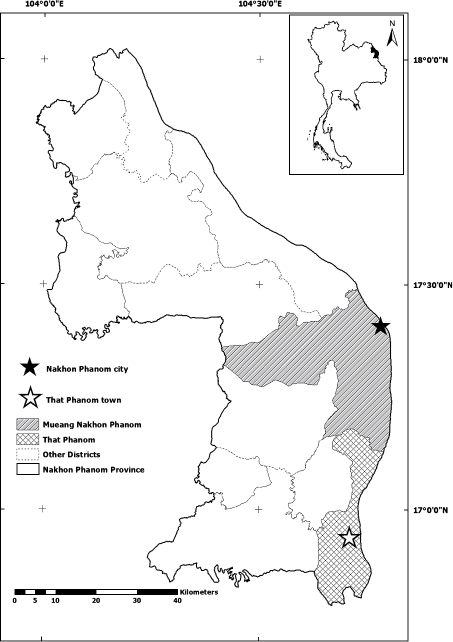 That Phanom Municipality covers parts of That Phanom and That Phanom Nuea Subdistricts. Land use maps for 2006 and 2010 of both districts were obtained in shapefile format from Land Development Department Office 4 in Ubon Ratchatani. These maps were made from unclouded and terrain corrected Landsat images in 2006 and 2010. Image processing and data manipulation were conducted using ERDAS IMAGINE 8.6 and ArcGIS 9.1. A handheld Garmin GPS eTrex HC (12–15 m accuracy) was used to obtain the coordinates of plots with different types of land uses. Some ancillary data were also used as references in image processing (Land Development Department 2010). Information on the causes of some important types of land use changes in several localities was collected from local officials and farmers by holding focus groups. This was done after the changes in land use were analyzed and several problematic types of change were identified, especially conversion of paddy fields to forests and vice versa. Spatial analysis employing the Decision Support System Research and Development Network for Agricultural and Natural Resource Management (DSSARM)1)1) Program was used to identify all plots that had been converted from one land use to a different one between 2006 and 2010. DSSARM images of the two districts were analyzed using a supervised classification method. This classification was used to compile Tables 1a and 1b. The changes in land use between 2006 and 2010 are presented in Tables 1a and 1b. It is readily evident that a great deal of change occurred during this five-year period. In Mueang District, about one-eighth (12.1%) of the area (9,477 ha) was in different use in 2010 than it was in 2006. In That Phanom District the magnitude of change was even greater, with more than one-fourth (27.3%) of the area (9,326 ha) changing uses between 2006 and 2010. In Mueang District there was a small decrease in the area under agriculture from 47,920 to 47,249 ha a net loss of 671 ha, while in That Phanom District it increased from 25,327 to 26,303 ha, a net gain of 976 ha. The area of settlement increased in Mueang District by 1.4 times from 4,644 to 6,950 ha, which was a net gain of 2,306 ha; in That Phanom District it increased by almost 1.3 times, from 2,413 to 3,032 ha, for a gain of 619 ha. Given these increases in the area of agricultural land in That Phanom District and the area of settlement in both districts, the decrease of natural forest is not surprising: it decreased in Mueang District from 22,089 to 19,484 ha for a net loss of 2,605 ha, while in That Phanom District it decreased from 4,226 to 2,611 ha for a net loss of 1,615 ha. In Mueang District in both 2006 and 2010 the four most important land uses in terms of area covered were rice, natural forest, settlement area, and water. In That Phanom District in 2006 they were rice, natural forest, orchards, and settlement area; in 2010 rice was still in the first place followed by rubber, settlement area, and natural forest. In both districts there was a major shift from other land uses to rubber plantations. Rubber plantations expanded at the expense of rice, eucalyptus, and specialty crops in Mueang District and orchards, cassava, specialty crops, rice, and sugarcane in That Phanom District. In Mueang District the area of rubber increased by 23 times (from 59 to 1,353 ha) for a net gain of 1,294 ha, while in That Phanom District it increased by 22 times (from 246 to 5,498 ha) for a net gain of 5,252 ha. However, after the period under study, in 2011, a steep decline in latex price led some farmers to begin shifting out of rubber into other crops. Rice fields suffered significant losses of area in both districts: 1,100 ha in Mueang District and 735 ha in That Phanom District. A major cause of the decline in Mueang District was the expansion of urban settlements, with 1,027 ha of paddy fields converted to settlement area. At the same time, however, 206 ha of settlement area were converted to paddy fields. This was land on the fringe of villages that may not have actually contained houses in 2006. Curiously, the area of rice fields in Mueang District lost 776 ha to natural forest but gained 1,522 ha from natural forest during this period. The rice fields that were converted to forest were in areas where the government ordered farmers to stop illegal cultivation of publicly owned forestland, while the forestland that was converted to paddy fields was located in areas where the government had reclassified degraded forestland for agricultural uses. Orchards also lost 408 ha and 2,580 ha respectively in Mueang and That Phanom Districts, while the area devoted to growing specialty crops (e.g., tomatoes, chilies, tobacco) also declined in both districts. The area of eucalyptus plantation declined from 442 ha to 182 ha in Mueang District; most of this area was changed to natural forest and rubber. In That Phanom District it increased from 1,019 ha to 1,700 ha. This expansion was initially promoted by a private company primarily at the expense of natural forest, orchards, cassava, and rice paddies. Other land uses, such as grassland, showed small gains in area in both districts. Sugarcane was not planted in Mueang District, whereas in That Phanom District it suffered a loss of area of almost two-thirds, dropping from 328 ha to 97 ha, with most of that area converted to rubber. Water (swamps, fishponds) lost 471 ha and 258 ha respectively in Mueang and That Phanom Districts. Almost half of the lost area in Mueang District was converted to settlement area, whereas in That Phanom District it was converted to grassland. Based on our field observations and discussions with farmers we have identified several factors that exerted an important influence on land use changes in our study site. These factors include: (1) lack of secure land titles; (2) urban growth and expansion of housing estates and infrastructure (e.g., roads, public buildings, airports) into peri-urban areas; and (3) changes in the costs and benefits of growing different crops. A dispute and a lawsuit over landownership resulted in abandonment of agricultural land and its reversion to natural forest in Kham Toei Subdistrict, Mueang District. There, in the late 1990s, there were approximately 160 ha of village community forest. An entrepreneur illegally cleared part of the forest for a rubber plantation. Villagers repeatedly asked the provincial officers to resolve the problem of overlapping claims to this land. Finally, in 2008, the Administrative Court declared the land to be public forest. The entrepreneur filed an appeal with the Administrative Court to revoke the order, but the case was later dropped even though the conflict over ownership had not been resolved. Because of the lack of secure tenure the land has been abandoned, and the area that had been cleared for rubber is reverting to natural forest. Nakhon Phanom Municipality and, to a lesser extent, That Phanom district town have experienced considerable population growth in recent years, which has led to rapid expansion of the settlement areas. New housing estates and infrastructure projects occupy former agricultural land in the neighboring subdistricts, which have been transformed from rural to peri-urban zones. This urban growth is a consequence of the rapid economic growth that has accompanied the opening of the new bridge across the Mekong River to Laos, the expansion of Nakhon Phanom University, and the development of the Nakhon Phanom airport. Students attending the university, which has campuses in both Nakhon Phanom Municipality and That Phanom district town, have created a strong demand for new housing. The airport, which is located in Na Sai Subdistrict, on the outskirts of Nakhon Phanom City, was opened in 1977. It has recently undergone a major expansion so it can serve as a transit point for passengers bound for neighboring countries via the new bridge. It also serves as the home base for Nakhon Phanom University’s International Aviation College. Many restaurants, shops, and service enterprises have developed to serve the airport’s users. As a consequence of the employment opportunities offered by the airport and associated businesses, the population of nearby communities has expanded, with new housing taking over land formerly used for agriculture. Also located in the subdistrict is the Nakhon Phanom Municipality landfill, which occupies approximately 12 ha in Ban Sukkasem. This facility receives an average of 70 tons of waste each day. Located in close proximity to the landfill are a number of recycling businesses that occupy former farmland. Similar conversion of farmland to urban use is occurring in Ku Ru Ku Subdistrict. This subdistrict is home to the Nakhon Phanom Army Camp and the associated military hospital. Developers have bought agricultural land surrounding the camp to build housing for service personnel and hospital staff. The value of farmland has increased by as much as 30 times in 10 years. Much of the land use change in both districts has resulted from the conversion of land from other uses, especially natural forest, orchards, and rice paddies, to rubber. This change was accelerated after 2006, as the pioneer farmers, who had planted small areas of rubber during the early 1990s, began to earn high profits, which influenced neighboring farmers to also plant rubber on their land. The decision making of many farmers was more influenced by knowledge about rubber conveyed through their social networks, sometimes across the provincial boundary, than by government extension programs. According to interviews with rubber farmers, they heard about the success of rubber farmers in nearby Nong Khai and Bueang Kan Provinces. The increasing price of rubber and the higher cost of agricultural labor, which reduced the profitability of rice cultivation at that time, also provided farmers with an incentive to convert their paddy fields into rubber plantations. The land use system in our study area is quite dynamic, with rapid changes of use occurring in extensive areas during the period of five years between 2006 and 2010. Two major changes in this study area are expansion of rubber and expansion of settlement areas. Although at first glance it appears that rubber is expanding at the expense of all other uses, the reality on the ground is not so simple. It is true that the expansion of rubber plantations has often occurred at the expense of natural forests and paddy fields. Conversion of forest into rubber plantations is especially rampant in areas along the roads, where the population is concentrated. In both Mueang and That Phanom Districts, many farmers whose livelihoods were once dependent on diversified agriculture have become dependent on a monocultural system with concomitant instability due to variable product prices. However, this shift reflects the fact that farmers have become highly sensitive to price changes of their products and altered their land use accordingly. This would never have occurred when they were subsistence-oriented peasants. In the past, rice was the most important crop for the Northeastern farmers. They all preferred to grow their own rice, even though it was a low-value crop, but now they are much more concerned with maximizing cash income from their land. The change of various types of land use to urban settlements has affected an even larger area than that affected by the expansion of rubber. Rapid development of the local economy, especially of the commercial and service sectors in the towns and cities, has resulted in the conversion of large areas of agricultural land to urban settlement. Many farmers who sold their land to urban developers have left the agricultural sector and become dependent on non-farm income. Such a change from farmland to urban settlement uses, because it is essentially irreversible, may have greater long-term impacts on land use than shorter-term conversion of land from one crop to another. This research was partially supported by a grant (BRG5680008) from the Thailand Research Fund Basic Research Program to Prof. Terry Rambo and a scholarship under the Post-doctoral Program from Research Affairs and the Graduate School, Khon Kaen University. However, the views expressed here are those of the authors and are not necessarily shared by the funding agencies. We would like to thank Prof. Attachai Jintrawet for his constructive advice and support and for the opportunities to work in his GIS laboratory at the Center of Agricultural Resource System Research, Faculty of Agriculture, Chiang Mai University. Land Development Department. 2010. Soil and Land Use (Including Aquaculture) Maps for Each Province at a Scale of 1:100,000, Compiled at 1:50,000. Bangkok. Methi Ekasingh เมธี เอกะสิงห์; Chanchai Saenchyosawat ชาญชัย แสงชโยสวัสดิ์; Pongdhan Sampaongen พงศ์ธนว์ สำเภาเงิน; Pinpeth Sakulsongboonsiri ปิ่นเพชร สกุลส่งบุญศิริ; Phraphassorn Pansompong ประภัสสร พันธ์สมพงษ์; Charit Soomham ชาฤทธิ์ สุ่มเหม; Wattana Pattanathaworn วัฒนา พัฒนาถาวร; and Chatnapa Prommanon ฉัตรนภา พรหมมานนท์. 2005 (2548). Rabop sanapsanun kan wangphaen chatkan sapphayakon phuea kan kaset lae kan borikan raya thii 1 phaak nuea tambon: kan chai sapphayakon kae rabop sanapsanun kan tatsinchai (rabop klang) ระบบสนับสนุนการ-วางแผน จัดการทรัพยากรเพื่อการเกษตรและการบริการ ระยะที่ 1 ภาคเหนือตอนบน: การใช้ทรัพยากรและระบบการตัดสินใจ (ระบบกลาง) [Decision Support System for planning of agricultural resource management and services 1st phase upper north Thailand: Resource utilization and decision support system (the core system)], Faculty of Agriculture, Chiang Mai University, A Final Report of a Research Project no. NIG45006, submitted to the Thailand Research Fund (TRF). 1) DSSARM is an integrated Geographic Information System (GIS) program developed for general users to enter and display data layer maps and data tables. Using this system requires a shorter learning period than a full-grown GIS program. It was developed by Visual Basic 6 and ArcGIS version 9.3 and designed to handle the spatial data in geodatabase format. DSSARM was designed to ensure the effective uses of spatial and attribute databases in the planning and management of agricultural and natural resources (Methi et al. 2005). « Vol. 6, No 2, CHALEE Gedgaew et al.